Bullets will not halt the flight of moonshine. The heart leaps windward with the kite of moonshine. Waiting in the tunnels for a byte of moonshine. The upper crust of yore lose the right of moonshine. A black sun has risen since the night of moonshine. Fortunes of my foes kiss the white of moonshine. Forbid me to step out in the light of moonshine. What a glorious ghazal!!! Every couplet is a work of art. I salute you as I take pure delight in your rite of moonshine! No one else than you has inspired me to write ghazals in English. The poetic endorsement will be cherished. Beautiful. Could totally relate to this one. I am glad we are on the same page, Karthik. I’m glad you passed by those who cabaret in the blinding noon, and you were able to dance in the moonshine. I too would try a ghazal if you and Cynthia hadn’t set the bar so high. Going by those exquisite 1001 compositions, you can write a ghazal even in your sleep. Cynthia is the maestro of prosody; I am but taking my baby steps. That’s very kind! It certainly would put people to sleep. It’s amazing how far baby steps can take you! So much depth in these beautiful words, lovely! In that case, I seem to have passed the test of ghazals! Ahh Umaji. Your Ghazal serenades in the most memorable ways. Many thanks for the honour, Anupam. Thanks for your kind words, Maniparna. Drawn as I am by the sound of your verses, this minion is hoping that her interpretation of is in consonance with that of the creator. I am led by the terms like Facebook and Byte to infer that this is about the battles we wage on the virtual space. Do correct me if I am wrong. Let me put it like this: I am in consonance with my patrons like you. Facebook is but a manifestation of the thought process symbolising a cultural shift to nada of which the urge to post statuses and selfies are the most common symptoms. The second verse clearly belongs to the affliction affecting our lives on multiple levels. The urge to blog, Shadows of casteism, communalism, misfortune in love and parochialism colour and suffuse other couplets. I fervently hope so, my friend! There’s truly magic in here ! Beautiful Uma ! Which goes on to prove you are not a Muggle. A ton of thanks! And so I hope, Rajni ji. Many thanks to you for reading. After reading your poem, feeling like taking a Bite of the moonshine. Nice poem. You are welcome, Mr Dash. Your poem can some day become real given the stupidity of the human race. I fervently hope not, and yet, it is already happening. Your mastery with words is unparalleled. And there is such magic in your poetry. Lovely piece. Raju, what you call mastery is only the smog of an agitated mind. Thank you for those sweet words, my friend! So good to see your blog back, your posts are always touched my heart. The show must go on… Thanks, Naddy. 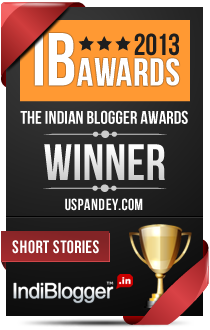 Sir, will you please share the link to your short stories for which you have won the award.. The award doesn’t specify which stories; the links are there in the side bar, my friend. Found this gem. You made my day, Uma. A thing of beauty was what I needed today.